The objective of the study is to present opportunities and barriers concerning the development of regional bean production with geographical indication and designation of origin, in Poland, in 2012-2017. The specificity, scale and conditions of production of three Polish regional bean species are described including the background of changes in the area cultivated with bean, its yield, production and development of buying-in prices. Attention is drawn to objective and subjective factors slowing down the certification process of leguminous crop production in accordance with producer specification. Information from the following databases has been used in the study: FAOSTAT, Eurostat, GUS (Central Statistical Office), JIHARS (Agricultural and Food Quality Inspection), as well as the following associations of regional bean producers (Association of Climbing Bean ‘Piękny Jaś’ Producers in Wrzawy, Association of Bean Producers in Nowy Korczyn, Cooperative ‘Dolina Dunajca’ and LAG (Local Action Group) ‘Biała-Dunajec’). The niche character and small previous production volume mean that regional beans PDO and PGI are only available in season for a small group of consumers. 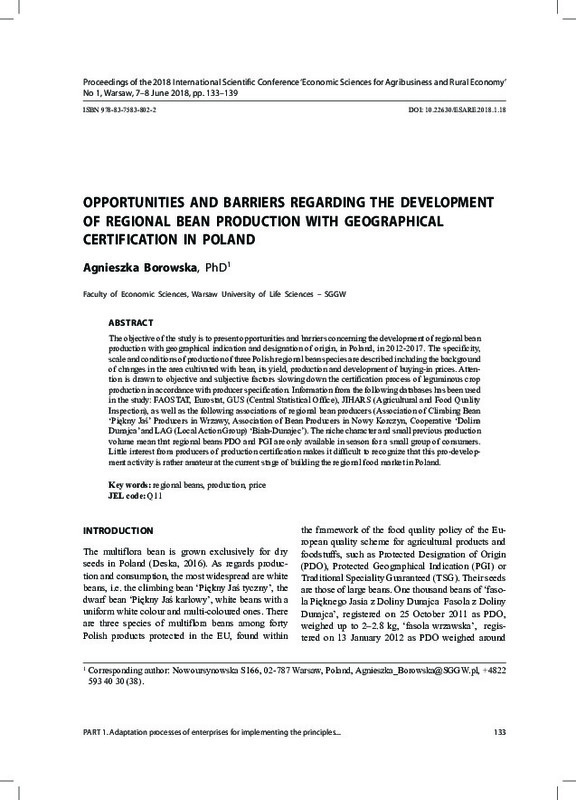 Little interest from producers of production certification makes it difficult to recognize that this pro-development activity is rather amateur at the current stage of building the regional food market in Poland.